Fully licensed and insured, Carolina Fence Co. offers a complete line of residential, commercial and Industrial fencing in metal, wood and vinyl. We install perimeter security fence, industrial gates, AC unit cages, bumper posts, ornamental products, dog kennels, athletic fences, privacy fencing, core drilled or plated fencing (concrete surfaces), and fence repairs. 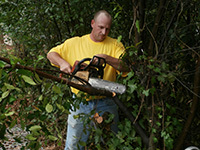 Located in Anderson, S.C., we’ve been servicing the upstate for over a quarter century. With more than 60 years of combined experience in the fence industry, our success and reputation are due to our commitment to giving every customer the very best product at the lowest possible price. 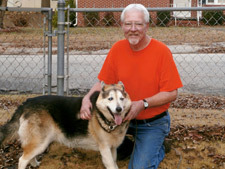 The best in pet containment – owner Bob Smith, an animal rights activist, National Audubon Society member and life long pet lover, takes special interest in your pet containment needs. He will offer suggestions and personally assist you in finding the very best pet containment solutions. We offer complete yard containment systems for cats as well as dogs and other pets. 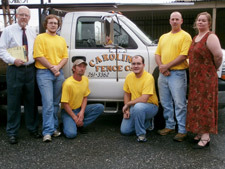 Carolina Fence Co. offers unsurpassed quality at the lowest price. We also offer 100% financing plus many extra services designed to make your fencing experience easy and convenient – all at no extra cost to you.